Written discourse is a major class of data that learners produce in online environments, arguably the primary class of data that can give us insights into deeper learning and higher order qualities such as critical thinking, argumentation, mastery of complex ideas, empathy, collaboration and interpersonal skills. 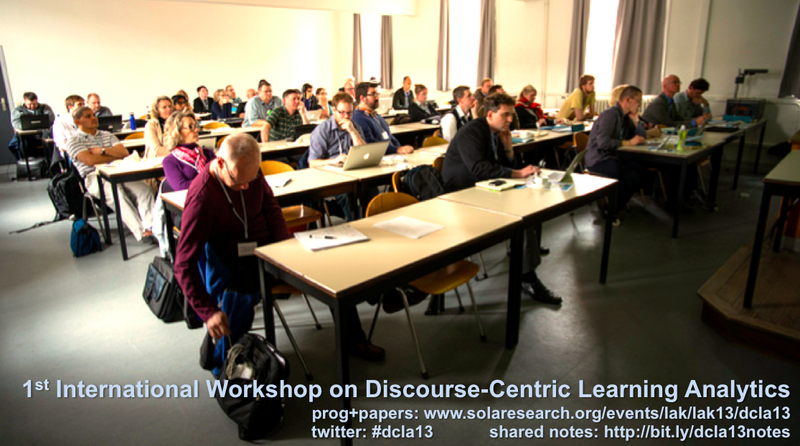 It is central to the collaborative and social learning that takes place online and there is a correspondingly significant literature on discourse analysis for online learning/CSCL. Computer-supported discourse ranges from unconstrained forms of interaction to more structured forms, where structuring refers to the constraints that the user interface places on how one contributes (eg flat commenting, threaded forums, blogging, argument mapping…). Computational linguistics research in academia and business (eg. IBM’s Watson) has developed a rich array of automated tools for machine interpretation of human discourse, but work to develop these tools in the context of learning is at a relatively early stage. Moreover, there is a significant difference between the use of such tools to assist researchers in discourse analysis, and their deployment on platforms in order to provide meaningful analytics for learners and educators. 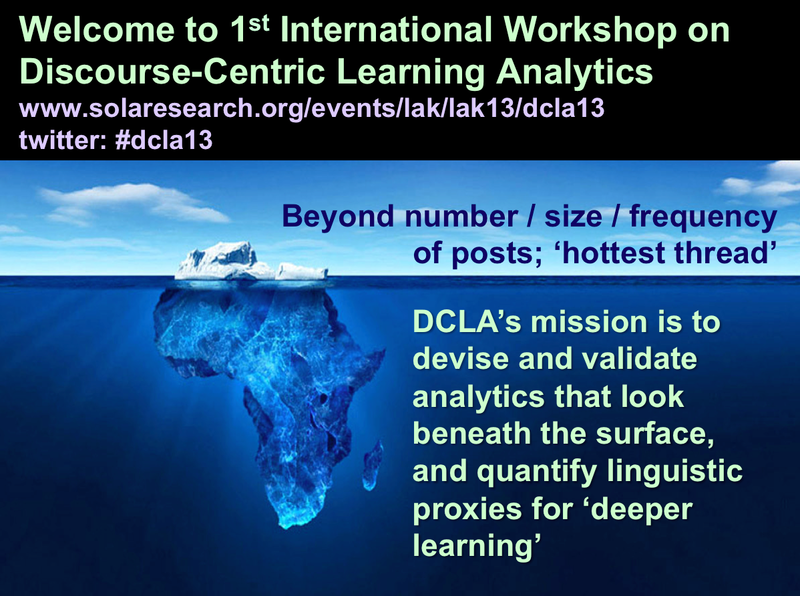 We argue, therefore, that a major class of learning analytic will emerge at the intersection of research into learning dynamics, deliberation platforms, and computational linguistics. What will make these learning analytics, as opposed to research that sits in any of the above categories, will be their use to generate information displays that help learners and/or educators to understand where significant discourse patterns are happening and that support interventions to improve discourse for learning. Conceptual/theoretical papers might establish a framework for thinking about Discourse-Centric Learning Analytics based on learning theory, or an analysis of current computer-supported discourse platforms. Simon Buckingham Shum is based at the UK Open University’s Knowledge Media Institute, where he is Professor of Learning Informatics, Associate Director (Technology), and leads the Hypermedia Discourse group. He is also a Visiting Fellow at University of Bristol Graduate School of Education. researches, teaches and consults on learning analytics, social learning media, collective intelligence and dialogue/argument visualization. He was Programme Co-Chair for the 2012 Learning Analytics conference, a co-founder of the new Society for Learning Analytics Research, and is a regular invited speaker on the topic. He brings a human-centred computing perspective to the challenge of building analytics, collective intelligence and sensemaking tools, informed by a longstanding interest in discourse modelling and argument visualization. Maarten de Laat is professor and director of the Networked Learning research programme at LOOK – Scientific Centre for Teacher Research, Open Universiteit Nederland. His research concentrates on professional development, knowledge creation and sharing through social networks and the impact ICT-tools and online interaction has on the way these networks work and learn. He has published and presented his work extensively in research journals, books and conferences. 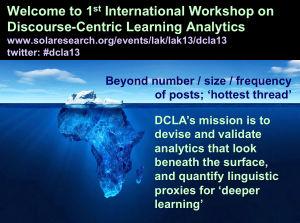 He is co-chair of the International Networked Learning Conference and has participated in the organization of several workshops on connecting levels and methods of analysis in networked learning research and learning analytics for the CSCL, HICSS and LAK conferences. Anna De Liddo is Research Associate at Knowledge Media Institute of the Open University (Milton Keynes, UK), where she works on the socio-technical factors influencing the design and uptake of Online Deliberation and Collective Intelligence infrastructures. These are online systems which seek to improve collective awareness of the changing environment, and collective capacity to make sense of complex issues. She has a particular interests in knowledge construction through discourse, and the role of technology in scaffolding dialogue and argumentation in contested domains. The approaches she works with are network-centric, modelling and visualizing ideas and arguments as networks of nodes which can be analysed for topographical and semantic patterns. These interests lead to specific research on the potential application and impact of discourse-centred & visual learning analytics. Rebecca Ferguson is a full-time research fellow in the UK Open University’s Institute of Educational Technology, focused on Educational Futures. She works as research lead on the SocialLearn team, developing and researching initiatives to improve pedagogical understanding of learning in online settings, to design analytics to support the assessment of learning in these settings, and to extend the university’s ability to support learning in an open world. Her research focus is on how people learn together online, particularly through synchronous and asynchronous textual communication, and on how learning analytics can be used to make learning more effective. Paul A. Kirschner (1951) is professor of Educational Psychology and Programme Director of the Learning and Cognition programme at the Centre for Learning Sciences and Technologies at the Open University of the Netherlands. He is also scientific director of the Netherlands Laboratory for Lifelong Learning. He is an internationally recognized expert in his field. He is a past President (2010-2011) of the International Society for the Learning Sciences, a member of the Scientific Technical Council of the Foundation for University Computing Facilities (SURF WTR), is associate editor of Computers in Human Behavior and chief editor of the Journal of Computer Assisted Learning, is author of the highly successful book Ten steps to complex learning, and editor of two other recent books (Visualizing Argumentation and What we know about CSCL). Andrew Ravenscroft is a Psychologist and Learning Technologist who is a Professor of Education in the CASS School at University of East London (UEL). He has published widely and led many projects that have used discourse analysis and dialogue modelling techniques to understand learning dialogue and develop digital tools that promote critical and creative discourse practices. This foundation inspires his current focus is on designing and implementing next generation smart, social and media-rich technologies for learning in the digital age, in ways that are strongly informed by theory. He has a leading international profile in this area, through publishing over 120 articles, being an active member of international and national committees and working groups, being an investigator on a broad portfolio of projects in Technology Enhanced Learning (TEL) over the past 20 years. Recently, he was the Programme Chair for the European Conference on Technology Enhanced Learning (EC-TEL 2012) and has Guest Edited two Journal Special Issues in Social Software and Learning. Throughout, Andrew adopts a ‘dialogue lens’, to understand and promote deep learning and meaning making within new and emerging digital contexts. Ágnes Sándor is a researcher in natural language processing at Xerox Research Centre Europe. She has a PhD in linguistics from the University Lyon 2. Her activities have included all layers of automated linguistic analysis. Over the past years, she has been concentrating on information extraction, discourse analysis and content extraction based on meta-discourse, with a focus on scholarly discourse both in natural sciences and humanities. She is involved in research on integrating human and machine annotations in a common platform and on the role of NLP in discourse analytics. She has published papers on all these fields. Denise Whitelock is Professor in Information Technology at the Open University’s Institute of Educational Technology, specialised in building feedback models for e-assessment systems. She has recently been awarded an EPSRC grant to provide an effective automated interactive feedback system that yields an acceptable level of support for university students writing essays in a distance or e-learning context. She has chaired the Computer Assisted Assessment Conference since 2010. She holds a visiting Chair at the Autonoma University, Barcelona, and the British University in Dubai, an Honorary Research Fellowship at The Open Polytechnic of New Zealand. She was the Joint coordinator for the Assessment Sig (2005-2009) for the European Association for Research on Learning and Instruction (EARLI) and was elected to serve for another 3 years as a member of the governing council of the Society for Research into Higher Education.